An unaltered photocopy of your DD-214, WD AGO or NGB-22. 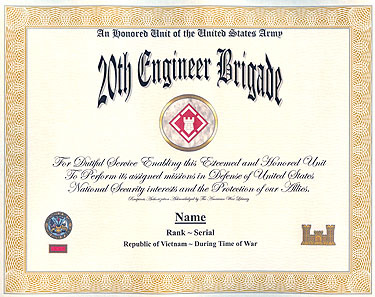 If your service with the 20th Engineer is not displayed on your DD-214 you must provide a copy of your DD-214 -AND- a copy(s) of any military-issued clearly displaying your service with the 20th Engineer. The 20th Engineer Brigade (C)(AC) provides proactive, timely, and essential expeditionary engineer support to the XVIII Airborne Corps, the Army, and when directed, joint and special operations forces. The lineage and honors of the 20th Engineer Brigade date back to the Civil War. First designated as the Battalion of Engineers on August 3, 1861, the battalion participated in ten campaigns during the Civil War. Since that time, unit designations changed many times as predecessors of the 20th Engineer Brigade served in the War with Spain, the Philippine Insurrection, the Mexican Expedition and World Wars I and II. On August 16, 1950 the brigade was first designated as the 20th Engineer Brigade and activated at Camp Leonard Wood, Missouri. The brigade deployed overseas in November 1952 and provided engineer construction support in southwestern France. Upon redeploying back to the United States, the brigade was activated at Fort Bragg, North Carolina, on September 10, 1954. From that time until its inactivation on December 12, 1958, the brigade provided engineer support to XVIII Airborne Corps. In response to the build up of U.S. forces in the Republic of Vietnam, the brigade headquarters was reactivated on May 1, 1967 at Fort Bragg, North Carolina and deployed to Vietnam in August 1967. During the Vietnam conflict, the brigade consisted of over 13,000 soldiers organized into three engineer groups, with 14 battalions and 31 separate companies and detachments. The brigade provided all non-divisional engineer support in Military Regions III and IV during eleven campaigns. Units cleared more than one-half million acres of jungle, paved 500 kilometers of highway, and constructed bridges totaling more than six miles in length. As forces were withdrawing from Vietnam, the brigade was inactivated September 20, 1971. The 20th Engineer Brigade was reactivated at Fort Bragg, North Carolina on June 21, 1974 and assigned as a subordinate command of the XVIII Airborne Corps with one airborne combat engineer battalion, a heavy construction battalion and four separate companies. Since that time the brigade and its subordinate units supported the XVIII Airborne Corps fulfilling critical combat engineer, construction, topographic, and bridging missions. As requirements and the engineer force structure changed, the brigade inactivated the combat heavy battalion in 1987 and activated another combat airborne battalion. In 1989, the 30th Engineer Battalion (Topographic) was added to the brigade. 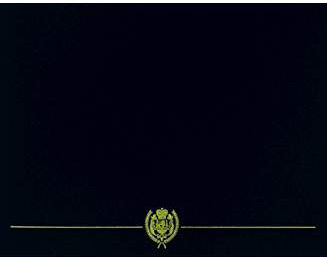 On August 2, 1990 the brigade was called to support the multinational response to the Iraqi invasion of Kuwait. The brigade grew to a 7,700 soldier force composed of three groups, ten battalions, four separate companies, and eight detachments in support of XVIII Airborne Corps during Operations Desert Shield and Storm. The brigade completed 1,500 combat heavy battalions equivalent days of work constructing roads, airfields, heliports, ammunition/fuel/water storage points, life support areas and forward landing strips, distributed over ten million maps, trained over 5,000 coalition engineers, and supported the French attack on Assalman airfield. During follow-on missions the brigade destroyed over 6000 enemy bunkers and one million tons of munitions. Today the 20th Engineer Brigade stands ready to provide rapid engineer support in response to any worldwide contingency mission. The 20th Engineer Brigade is proud of its long service to both the nation and the Army. Having participated in 33 campaigns, more than any other major subordinate unit in the XVIII Airborne Corps, the brigade is confident of a future of continued service to the XVIII Airborne Corps, the Army, and our Country.